Tradition is a tricky beast. There are those who would leave it as a dusty museum exhibit. Then there are others who see further, into the possibility of tradition, a line that runs through history all the way to the present. They’re the ones who respect the past but aren’t going to be hidebound by it, who make it a very vital part of now. People like Kuenta i Tambu, who’ve transformed the old tambú music of Curaçao into the 21st- century phenomenon of Tambutronic. Then meets now through hard kicks and hooky synths, the gritty good times that spawned bass music’s tropical, global offshoots, from baile funk to moombahton. 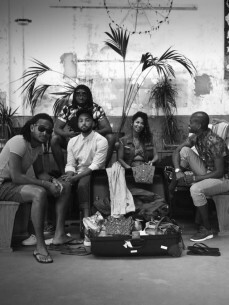 Taking up the sounds that evolved in Dutch clubs and mashing them effortlessly with the group’s percussive, evocative Caribbean roots, Kuenta i Tambu proves how easily traditional grooves can move in new, unexpected ways. Though as fresh as M.I.A. or Major Lazer, Kuenta i Tambu’s music began long ago and far away. On Curaçao, an island in the Caribbean close to the coast of Venezuela, history remains very much alive. Originally home to the Arawak Indians, it was conquered by the Spanish in 1499 and became Dutch in 1634. But in many ways it’s almost an outpost of Africa, a first stop for slave ships on their journey to South America, and the influence of another continent is still powerful. For centuries, the people have celebrated with drums and singing, styles like seú, muzik di zumbi (music of the spirits), and above all, tambú. “Like a lot of people, we were listening to hip-hop, to dance music,” Calister recalls. “We started experimenting with beats and electronics to give our music the feel that fascinated us in European electronic music, music we really loved. We released an EP and the style we call Tambutronic was born.” Since then Kuenta i Tambu have evolved and refined their music. They’ve introduced Tambutronic music to several continents and added a new singer, Diamanta, to make them into a five-piece. “The people there are very proud that we took the step to give the old music a new look,” Calister says. “We stay true to the roots but we also give the island its own voice in the modern world.” Older folks, familiar with the tradition, hear it in the music while youngsters who’ve grown up with American hip-hop, R&B and the global flavor of dance music, hear their own world reflected at them. And that’s an important way to keeping the past alive and strong. The band’s latest EP, Muchu Danki, continues to match rhythms to blunt electronics, relentless, innovative and blessed with incredible energy. The quintet is able to display a diversity to their sound ranging from tracks such as ‘Where To Go’ which is a laid back carnival groove and ‘Peace Of Mind’ billowing cross-currents between old and new. One thing, however, is certain: their energetic percussion is guaranteed to see some shapes on the dance floor and their hypnotizing beat is impossible to shake. Live, Kuenta i Tambu are a non-stop Carnival, a riot of beats and rhythms that take the audience deep into the Caribbean. Above all, though, it’s obvious that the musicians enjoy playing the music and the live percussion thunders through the air. Tambutronic: where Curaçao’s past dances with its future and takes on the world.